Pointing to a photograph of Hari, Vijay said, 'The father of his sister is the husand of my wife's mother'. How is Vijay related to Hari? Pointing to a man, Prasad said, 'His only brother is the father of my daughter's father'. How is the man related to Prasad? The mother of Suresh is the only daughter of Seema's father. How is Seema related to Suresh? Introducing a man, a woman said, 'He is the only son of my mother's mother'. Who is the woman related to the man? What is my mother's husband's father-in-law's son's daughter to me? What is my father's wife's grandfather's only child's son's daughter to me? How is my mother's brother's only sibling's son related to me? 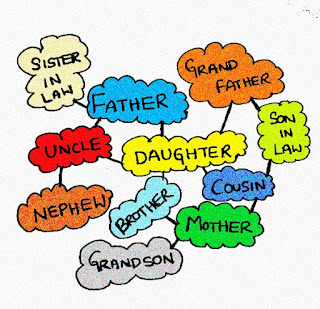 What is my father's father's daughter-in-law's son's wife to me, if both my father and his father have only one child each? Introducing a girl, Venu said, 'Her mother is the only daughter of my mother-in-law'. How is Venu related to the girl? Pointing to a lady, a man said, 'The son of her only brother is the brother of my wife'. How is the lady related to the man?